Würth Elektronik iBE is a manufacturer of customized inductors which are used in variety of automotive applications. With around 1600 employees worldwide, our production sites are located on all important markets of the world: Thyrnau and Esslingen (Germany), Budweis (Czech Republic), Belozem (Bulgaria), Shenyang (China) and Irapuato (Mexico). With our strategy local for local we can supply our worldwide customer base directly on-site. 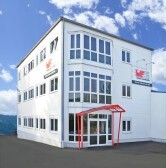 We employ 155 people at our headquarters in Thyrnau. Here is also located our technology center, our own environmental laboratory for product validation, as well as our sample and pre-production. With our process and automation know-how, we manufacture tools and machines in-house – more than 35 years of experience in the automotive business make this possible. The convenient location to the highway A3 allows employees to reach the company from different regions quickly and easily. Become part of our team. Through our continuous growth, we are always looking for qualified people in commercial and technical positions, as well as in the field of apprenticeship, dual study, training, internships and bachelor's theses. Here you can find out more about the location Thyrnau.